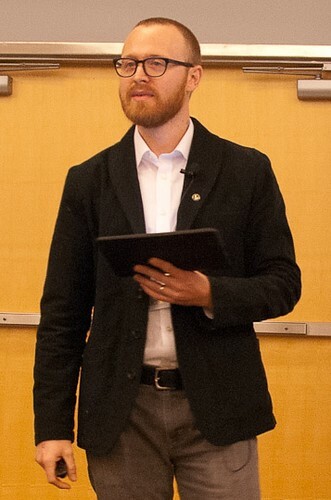 Micah Vandegrift, Scholarly Communication Librarian at Florida State University, delivered a lecture that highlighted the ways libraries can support the Open Access (OA) movement taking place in the academic community. The central thesis was that librarians need to take action and do Open Access instead of simply discussing it. He called this the “less yack and more hack” approach. The OA movement, which falls under the broad umbrella of scholarly communication, began in the late 1990s in response to the advent of the Internet and the global web of freely accessible information it made possible. The central idea was to create funding structures that maintain peer review standards while opening information to the public through article deposits in institutional repositories (known as “green” access) or publication in open access journals (known as “gold” access). Vandegrift said that librarians have discussed OA within the professional community for the past two decades. Yet at the present time, approximately 56% of professional journals in the field of Library and Information Science (LIS) are owned by commercial publishers. Traditionally, publication in such journals is attractive because of their reputation, the rigorous peer review process, and the readership (i.e. tends to draw experts in the field). These publications also carry a significant amount of weight when academics are up for tenure or promotion reviews. However, commercial publishers often limit access to journal subscribers – a practice that creates barriers between content and the general public. OA offers two distinct advantages that are not applicable when publishing content in commercial journals: the ability to reach the unintended reader, and the ability to exponentially increase the speed at which professional literature is disseminated. Vandergrift said that in order to effectively promote OA in the academic community, librarians must first determine what levels of openness are acceptable for the information professions’ scholarly output. This process involves negotiating for OA in contracts with commercial publishers, depositing work in institutional repositories, and moving the research facet of the library profession to OA platforms like e-LIS, an international digital repository. The next step is to examine scholarly communication initiatives and campus models for OA at individual institutions. Librarians are in a prime position to develop workshops and create publishing guides that educate stakeholders on OA best practices, digital project management, the peer review process, and copyright challenges. The evaluation of existing services also creates valuable opportunities for peer-partnerships with researchers and scholars in the academic community as well as collaboration across disciplines. Vandergrift said that it is important not to exclude students from OA discussions, as they are in the process of learning how to participate in scholarly discourse by publishing their own work. 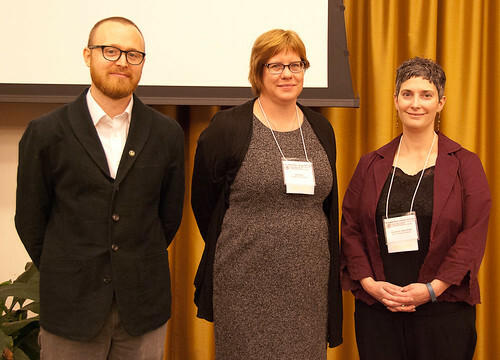 By educating budding young scholars, librarians can discuss the importance of OA and encourage the next generation of researchers to seriously consider sharing data, researching findings, and knowledge with an open global community. In his concluding statements, Vandegrift challenged librarians to not only promote OA, but to practice it in their professional lives. He left the audience with three take home points to consider: all librarians can invest in scholarly communication; all libraries need a scholarly communications initiative; scholarly communication initiatives build effective peer-partnerships with researchers and scholars.